We’d love your help. Let us know what’s wrong with this preview of Round the Circle by Julie Brill. Are you a doula, a professional who supports women and their partners during the childbearing year? Do you feel called to become a doula because of your passion for women, birth, and babies? In Round the Circle, Julie Brill gathers the wisdom of 23 established doulas, who generously share what they’ve learned to create a doula mentorship in book format. Contributors includ Are you a doula, a professional who supports women and their partners during the childbearing year? Do you feel called to become a doula because of your passion for women, birth, and babies? 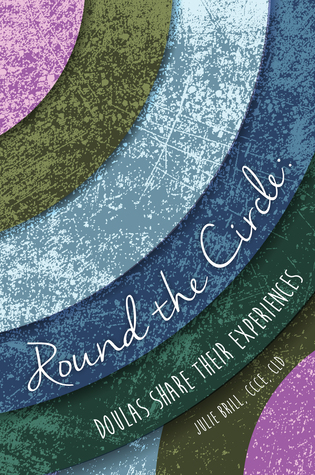 In Round the Circle, Julie Brill gathers the wisdom of 23 established doulas, who generously share what they’ve learned to create a doula mentorship in book format. Contributors include Laurel Wilson and Tracy Wilson Peters, authors of The Attachment Pregnancy, Rivka Cymbalist, author of The Birth Conspiracy, and Amy Wright Glenn, author of Birth, Breath, and Death. Learn more about addressing fears; encouraging the motherbaby bond; supporting religious and spiritual practices; working with LGBTQ families, teen mothers, surrogates, immigrants, incarcerated moms, friends and family; the doula’s role in planned and unexpected homebirths and cesarean births; supporting families after the birth; building and marketing your business; and doula self-care. To ask other readers questions about Round the Circle, please sign up. I could not put this down. Granted I am a doula geek/nerd, but I felt like all these people were sharing their experiences with me. Great! Julie Brill, CCCE, CLD owns and manages WellPregnancy in Bedford, Massachusetts. She has been teaching childbirth classes and attending births since 1992, and mentoring new birth professionals throughout New England as a member of the CAPPA Faculty since 2003. She is also a La Leche League Leader and certified to present Peggy Huddleston’s Prepare for Cesarean Birth, Heal Faster workshops. She gra Julie Brill, CCCE, CLD owns and manages WellPregnancy in Bedford, Massachusetts. She has been teaching childbirth classes and attending births since 1992, and mentoring new birth professionals throughout New England as a member of the CAPPA Faculty since 2003. She is also a La Leche League Leader and certified to present Peggy Huddleston’s Prepare for Cesarean Birth, Heal Faster workshops. She graduated from Tufts University, with a degree in Sociology and Women’s Studies, and completed the Massachusetts Midwifery Alliance Apprenticeship Course. Julie loves working with birthing families and specializes in natural and VBAC childbirth classes. She strives to provide accurate information and tools, so each birthing woman can choose the birth that is best for her. Julie believes birth is a normal, natural event with the potential to be extremely empowering.